with sayings such as “love is patient” (which is a great reminder for the 2 am feedings), “faith baby” and of course the inspiration behind it all “blessed baby”. The line doesn’t stop at onesies, also check out their oh-so soft blankets featuring psalm 139.14, hats, bibs and burp rags...their products are a wonderful quality and ever so sweet! 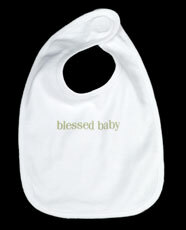 Check out www.blessedbabycollection.com to shop…and type in “belly” in the discount code when you check out for free shipping! !